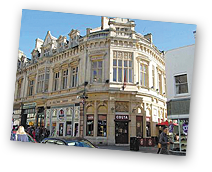 Cheltenham is well known and much loved as a shopping destination. A stroll around the town will quickly reveal a combination of large chain stores, modern department stores and independent boutiques sure to make a shopaholic’s heart flutter with excitement. Stunning floral displays, relaxed, uncongested arcades, wide avenues and pedestrianised streets characterise shopping in Cheltenham. Just steps from our luxury Cheltenham apartment, the Promenade is home to House of Fraser department store, Cavendish House, as well as several upmarket brands and a number of restaurants, cafés and coffee shops, including Café Rouge and Huffkins. In the warmer months, a stroll along the Promenade feels distinctly continental, with its al fresco eateries and brightly coloured flower beds. Cath Kidston, Molton Brown and L’Occitane blend with vintage shops, camera stores and jewellery retailers in this popular shopping quarter. Walk up the Promenade – past its colourful gardens, high street stores and Neptune Fountain – and through the beautiful Imperial Gardens with its outdoor bar and statue of Gustav Holst, and you’ll soon reach the Montpellier area of Cheltenham. Filled with stylish local boutiques, high-end specialist stores, and popular bars and restaurant – including the exciting new Ivy Montpellier Brasserie, situated in a converted bank – Montpellier shopping makes a refreshing change from the usual high street stores and restaurant chains. Explore a little further and you’ll reach The Suffolks – best known for its antique shops, handmade jewellers and homeware stores. No shopaholic’s trip to Cheltenham is complete without a visit to the High Street, with its large, fashionable shopping arcades – including the Regent Arcade, complete with the 45-foot-tall, Kit Williams-designed wishing fish clock, which attracts visitors from far and wide. Cheltenham High Street is home to Marks & Spencer, Monsoon, Boots, H&M, River Island and more, and its wide, pedestrianised streets make it a pleasant shopping experience, even on the busiest of weekends. Book your stay at 24 The Promenade, and check out Cheltenham’s shopping for yourself, knowing you’re just a short stroll back to your luxury accommodation when you’re well and truly shopped out!